Located just south of the Santa Monica Pier and the horrifying dudes who hang out with snakes wrapped around their necks, Cha Cha Chicken is a cheap, beachy shack with Bob Marley-esque vibes. It also happens to serve really delicious chicken. The most incredible thing about Cha Cha Chicken though? It’s BYOB. And that’s just not something that happens on Ocean Avenue. And unlike most other places that lure you in with their BYOB tolerances and then give you side-eye if you linger, you’re allowed to take as much time as you want to drink it here. It’s all pretty easy going inside the Cha Cha confines and nobody’s gonna give you sh*t if you choose to sit and enjoy an additional drink (or six) after licking your plate clean. With mostly outdoor dining (there is a small covered area), orders are taken at the counter and quickly delivered to the table. 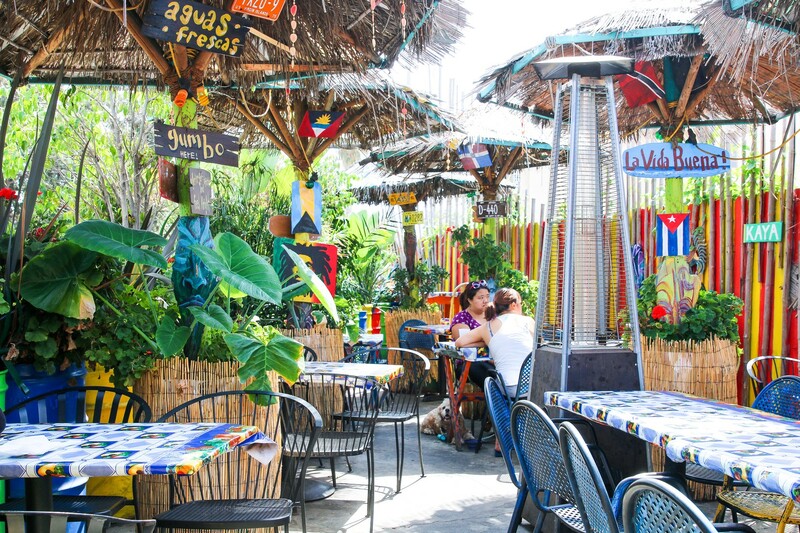 The food is authentic Caribbean with a Latin twist and definitely unlike anything else you’ll find in Santa Monica. In short, head to Cha Cha Chicken for delicious chicken, the BYOB policy, and serious island feels. The shrimp are on the small side but the pineapple/garlic combo makes this dish something you’ll want to have on your table. You’re going to need a plate of carbs to soak up the jug of wine you brought. Here it is. Jerk chicken and veggies on a lavash flat bread. This happens to be big enough to feed a family of four. Anything fried in coconut and served with mango and jerk dipping sauce is more than a-okay by us.